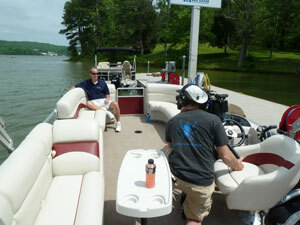 The top of the line pontoon boat from Harris stands up to the close scrutiny of reviewer Lenny Rudow. You don't order steak, you order filet. You don't order off the rack, you order tailored. 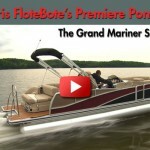 And when it comes to mustard, if you're in the Grey Poupon crowd, and you're looking for a pontoon boat, then you need to check out the Harris FloteBote Grand Mariner SL 250. 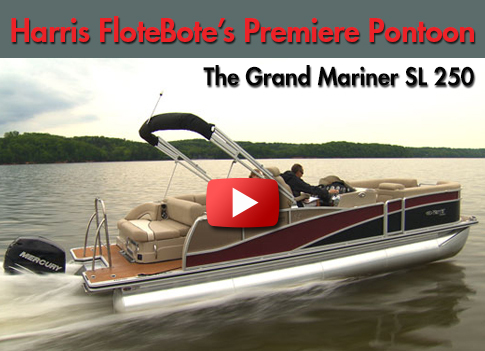 The Harris FloteBote Grand Mariner SL 250. The first really cool feature that's gonna catch your eye is this touch screen display panel. Now this has everything from GPS to engine data to a lighting system that includes all kinds of goodies. It includes speaker lights, rope lighting under the furniture, lighted cup holders, underwater lights, pod lights for docking that are LED and stainless steel. The boat's even rigged with cameras to the display. You can see video both forward and aft. Now let's say you're ready for some serious watersports action. Just check out this tow bar. 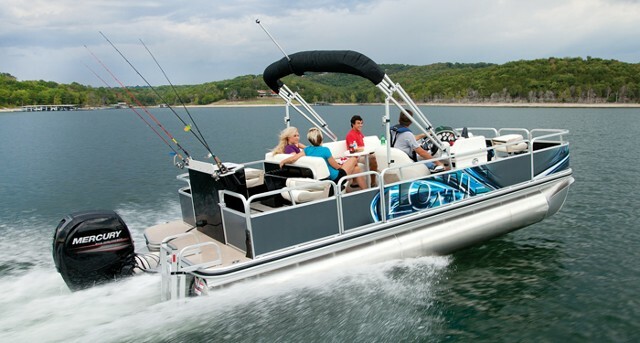 With a towline attached to the top you'll be catching some serious air. 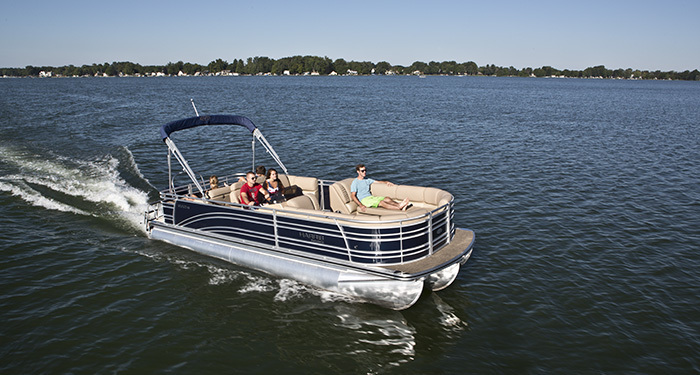 Here's a great thing about a pontoon boat of this size. Where are you going to keep all those wakeboards and waterskis? Check out this box. Not only does it have a gas assist strut, but this sucker is six feet long. Now to live the lifestyle you're interested in you gotta have comfort, right? These lounges to provide it, these things are comfy. But there's more to them than that. Pop it open for stowage, and you've got plenty of space to put all your gear. Your comfort level will be maintained at the helm with this captain's chair. And mom's favorite seat will be back here in this lounge. You even get a stereo remote. Keep the kids out of this seat. 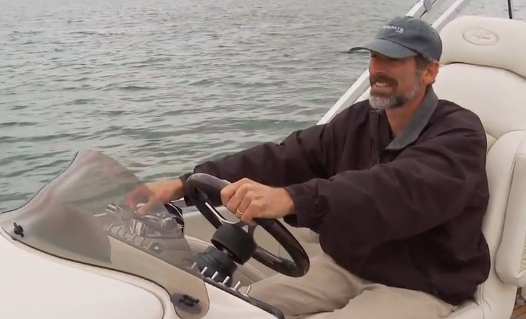 So just how well can a triple log pontoon boat perform? Top end we blasted right past 41 mph. And check this out, at 22 mph we got better than 2 mpg, that's pretty good. And just look at the handling. The design really does make a difference. LR: According to your brochure, this boat has both strakes and a stepped bottom. How do you do that on a pontoon boat? MW: The center tube has welded strakes and they're doubled, which creates a stepped surface that creates hydrodynamic release. It really allows the boat to bank in the turn. 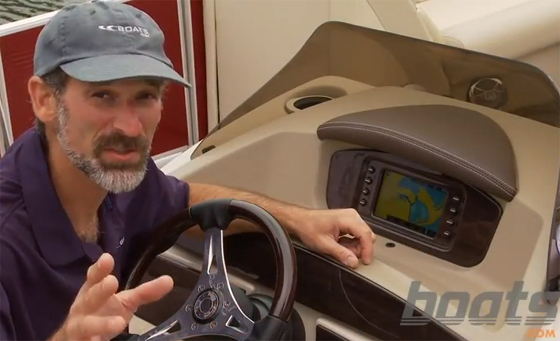 LR: So this boat carries 300hp, and goes well over 40mph. To do that you've gotta build it tough. What can't we see just glancing at it that makes it strong enough to handle those kind of stresses? MW: First I want to mention this is the Harris FloteBote patented dolphin nose cone. It's a two piece design, longer spray shield, and double cross braced back here. Secondly you'll notice that our cross pieces are spaced 16 inches on center, vs. the traditional 24 inches. That reduces the stress and torque and it's standard on all our models. Also you notice that our cross members come all the way out to the rubrail for additional support. That protects your deck in case of a collision. LR: I hate how some pontoon boats rattle and vibrate, but as we ran this boat it really didn't do that. Why? MW: We took the extra step of putting foam tape between the fence panel and the fence railing, to reduce the noise you get from any vibration. 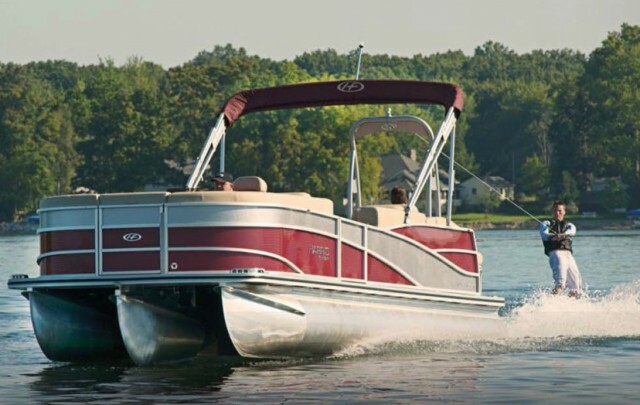 Pontoon boats are one of the most rapidly growing segments in the boating market, and with good reason. When you look at a boat like this you see better construction, more room, and more comfort than yesteryear's pontoons ever could offer. 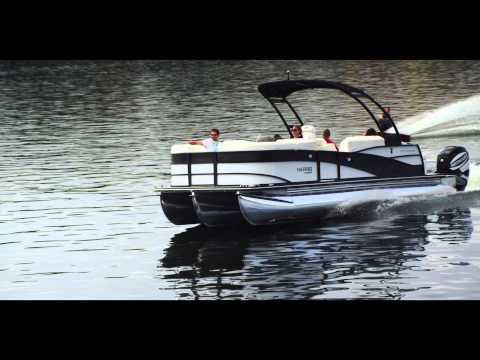 If you want to see just how much a boat like this can add to your lifestyle, check out the Grand Mariner SL 250. 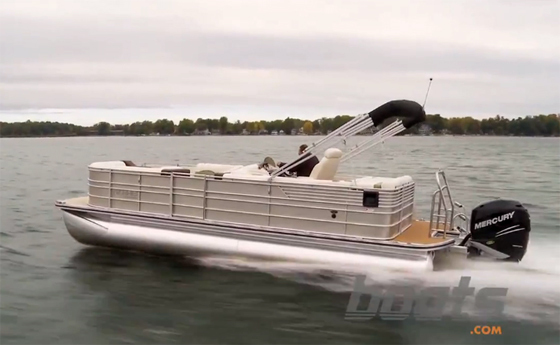 Can a Pontoon Boat be a Serious Fishing Boat?